ARE YOU LOOKING FOR SOMETHING UNIQUE AND FUN FOR YOUR BRIDAL SHOWER OR ENGAGEMENT PARTY? We hope so because we've got something you're going to love. It's a new product called Petal Wishes. 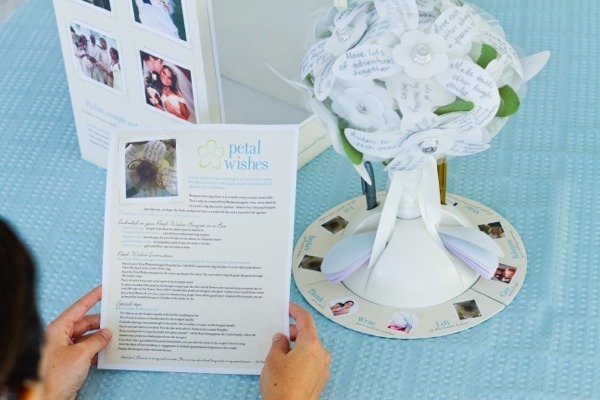 Petal Wishes is an innovative new product we offer that allows guests at your engagement party or bridal shower party to write down well wishes for you and your loved on petals that snap together to create a beautiful unique bouquet that you can use at your rehearsal party. There's nothing like it on the market right now, it's fun, non-traditional, and just a great way to be able to remember the days leading up to your wedding. Your wedding planning is something you'll only experience once in your life, so make the most of it by using our Petal Wishes as a way to cherish the memories for a lifetime. You can always go back and read well wishes on your petals to help bring back those butterflies in your stomach. Forget about the traditional ribbon and paper bouquets used at rehearsals, try something different and more personalized, go with Petal Wishes. We offer a variety of Petal Wishes products and packages to cater to your specific preferences and we'll go over them here. 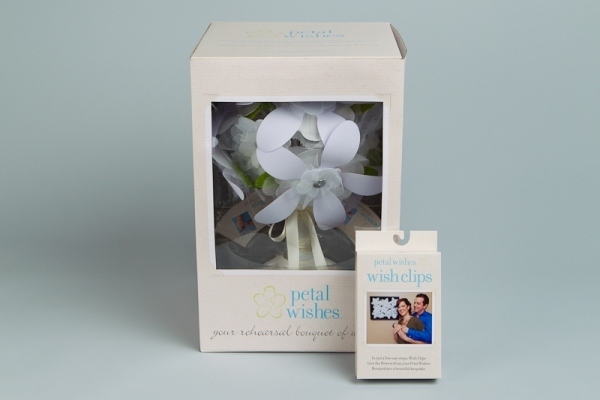 After you are done with your bouquet, if you prefer to remove the bouquet flowers for safekeeping, we offer a Petal Wishes Wish Clips which you can put in elegant shadow box with glass that allows you to put all of your Petal Wishes on display. This is great if you would rather hang something on your wall rather than have the bouquet sitting in an open area. 12 wish clips, which mount all the Petal Wishes and flowers into the shadow box. Or you can choose to go for the "Wish For It" package, which promotes creativity and personalization because it doesn't contain the shadow box to store your Petal Wishes in, you'll be able to place your bouquet in the frame of your choosing. 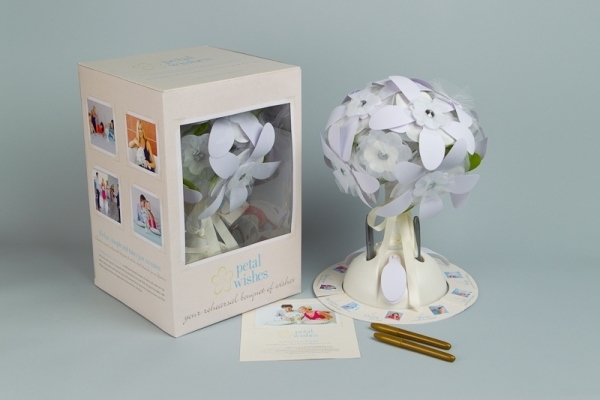 Petal Wishes will be fun for your friends, will help provide you with memories of the days leading up to your wedding, and it's fairly inexpensive.